This post is sponsored by College Inn®. All thoughts and opinions are mine. 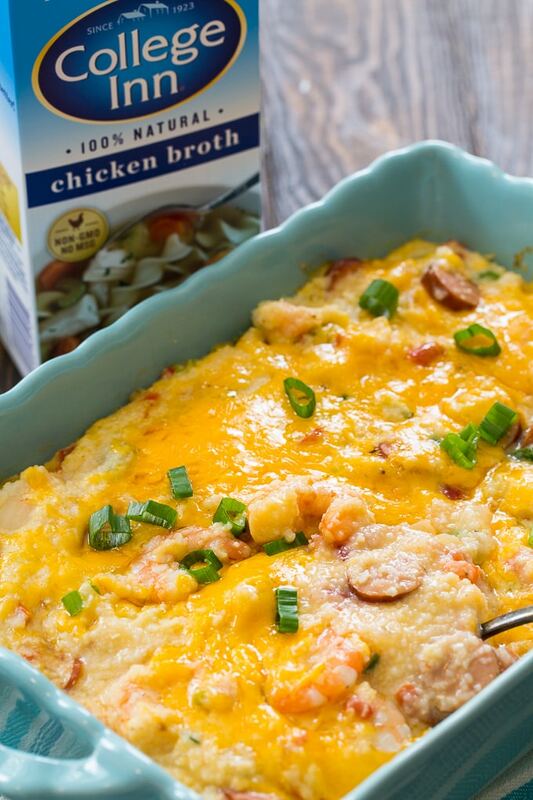 Shrimp and Grits Casserole is the casserole version of one of my favorite southern dishes. 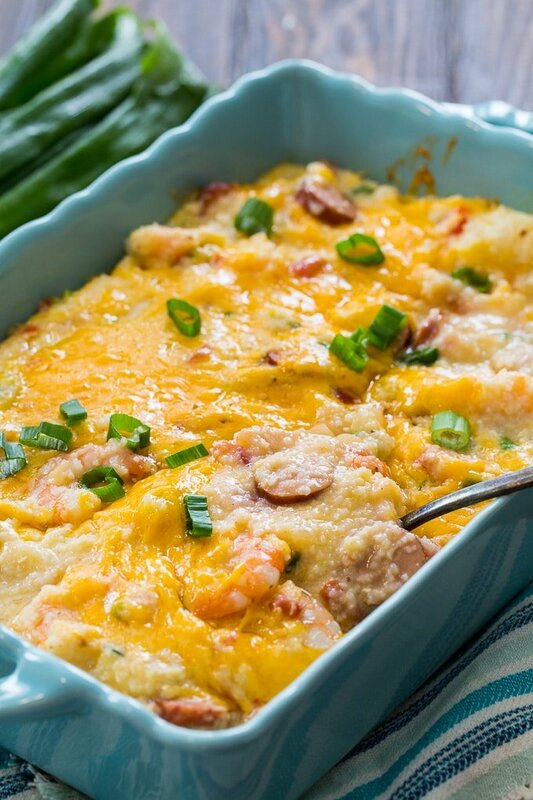 It’s creamy and cheesy with lots of fresh shrimp and andouille sausage. Easy to make and perfect for serving a crowd. Shrimp and Grits is a southern staple that originated as a simple low country breakfast for fishermen along the coast of South Carolina and Georgia. But it has become so popular, you see it on breakfast, lunch, and dinner menus all over the south. 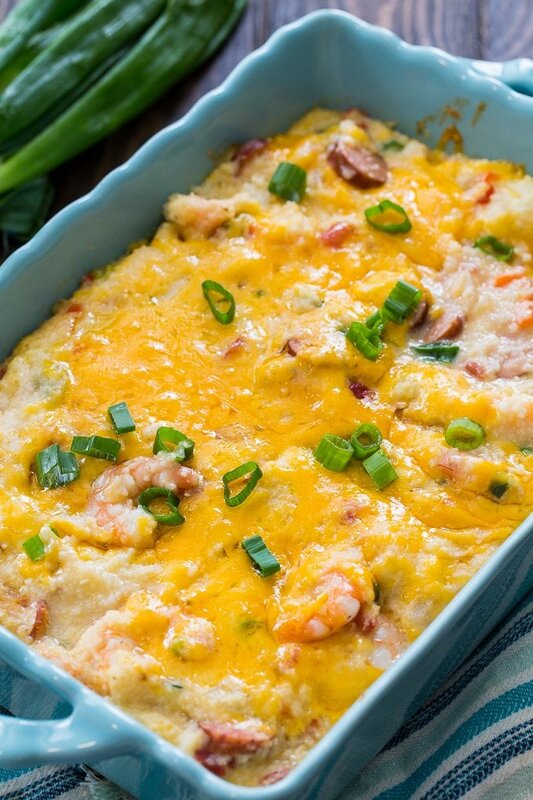 It really can be eaten for any meal of the day and this Shrimp and Grits Casserole works as a brunch addition or a family meal. 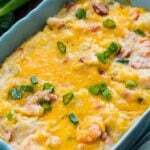 Shrimp and Grits is easily converted into casserole form which makes it a wonderful family meal or addition to a holiday brunch. It’s creamy, cheesy, and spicy with lots of shrimp and andouille sausage (you could use bacon instead). For extra flavor, I like cooking the grits in chicken broth and my go to broth is College Inn® Chicken Broth. College Inn® Chicken Broth is slow-simmered with the perfect blend of herbs and spices. It adds amazing flavor to any dish. I find that using quality ingredients makes all the difference in the finished meal. You are going to love this different take on Shrimp and Grits! If you try out this recipe, share the results online using #CollegeInnBroth! Preheat oven to 350 degrees and grease an 11X7-inch casserole dish. Melt butter in a large skillet over medium-high heat. Add onion, bell pepper, and jalapeno and cook until crisp-tender, about 3 minutes. Add garlic and sausage and cook until sausage is browned. Add tomatoes, shrimp, cajun seasoning, and green onions and cook just until shrimp turned pink. They will cook more in the oven so be careful not to overcook them. Remove from heat. In a medium pot, bring chicken broth and water to a boil. Add salt and gradually stir in grits. Cook stirring frequently, for 5 minutes. Place eggs in a small bowl. Gradually whisk in about 1 cup of the hot grits to temper the eggs. Add the egg mixture to the pot and whisk into the rest of the grits. Stir shrimp mixture and 1 cup of cheese into the grits and pour into prepared pan. Top with remaining cheese and bake for 40 minutes. My dish came out perfect. Since I normally do a seafood Christmas this was delicious dish will be on my table for Christmas. The grits were delicious but the shrimp were extremely tough. How can this problem be solved? Shrimp should only be cooked for a few minutes. The recipe calls for 40 min,. Is this a typo?? I wouldn’t cook the shrimp before putting them in the grits. I would not cook the casserole no longer than the cheese melts. I’ve never tried freezing it Lou.